A lot of people deploying SBS 2011 Essentials seem to have developed a special affection for the Launchpad app. That is to say they seek to disable it at the earliest opportunity. Personally on my deployments i have only disabled it on the users request, and on an individual basis. 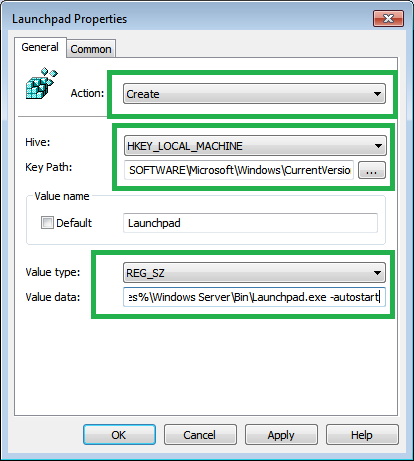 It is quite easy to do so if you wish, you can use MSCONFIG and remove the start-up entry. Those familiar with MSCONFIG will probably have already worked that out. The Launchpad does not control of any the advanced functionality of an Essentials client, so things like Client backup, monitoring etc will all still function if the Launchpad is disabled. I don’t really have anything against the idea of the Launchpad, in theory i think it is good. However, i don’t like that i cant configure it from the Essentials server and I don’t like that we cant opt out of installing it. I would like to see an option to chose which Shares are exposed through the Launchpad, and to configure which options are available at all. For example on a Desktop machine in an office they probably don’t need access to the RWA on the Launchpad. Anyway this wasn’t supposed to be a rant on the ills of the Launchpad, and just to prove it, here is a picture of the Launchpad. 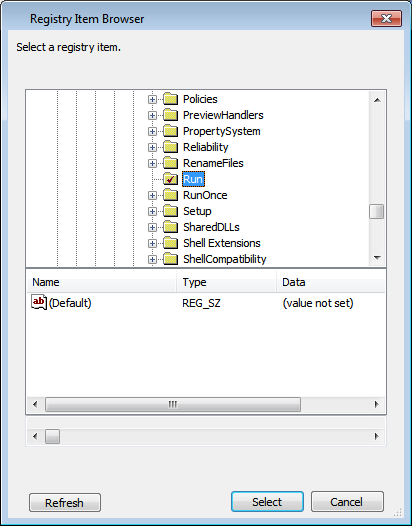 So moving on, if you want to Disable this using a GPO, Logon to your SBS Essentials Server, and open up the Group Policy Management Console from the Administrative Tools menu. Next, you will see your policy appear in the list. Right click the Policy and Choose Edit. 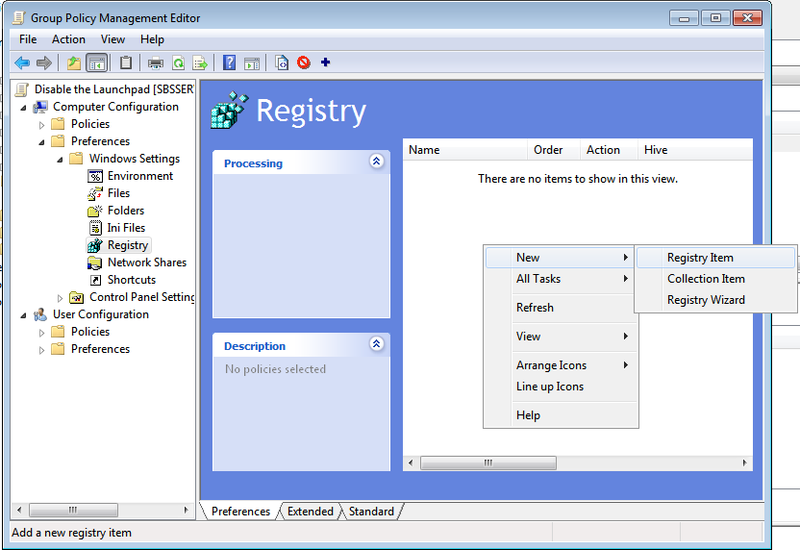 When the GPO Editor opens, expand Preferences, Expand Windows Settings, and go to Registry. 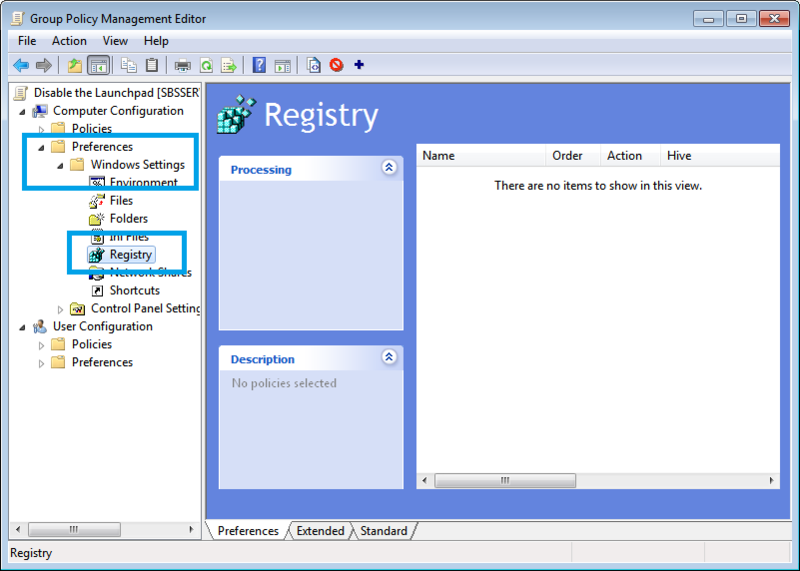 In the details pane where it shows ‘no items to show in this view’ right click and Click New, then Registry Item. 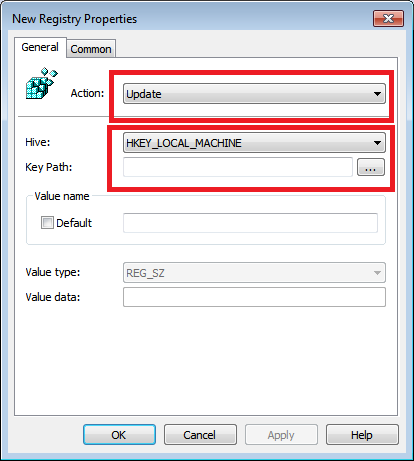 In the New Registry Item window, change Action, to Delete, and Under Hive, Select HKEY_LOCAL_MACHINE. Then select the select the Key Path button. Drill through until you get to HKLM>Software>Microsoft>Windows>Current Version>Run then click select. Next, under Value Name, enter Launchpad. Then click OK. You can then close the GPO editor and when your clients refresh their policies (GPO Preferences will refresh best after a reboot) the Launchpad start-up item will be removed and it will no longer run. But now you want to re-enable it? Not as simple as just removing the policy, we need to add the start-up item back into the Registry. We can copy and paste the GPO we just made, rename it, and then change the settings defined. 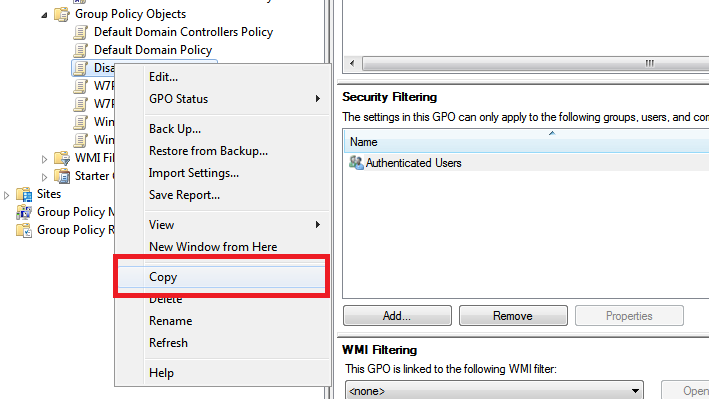 Go to the Group Policy Objects area of the GPMC, right click the Disable the Launchpad Policy and click Copy. 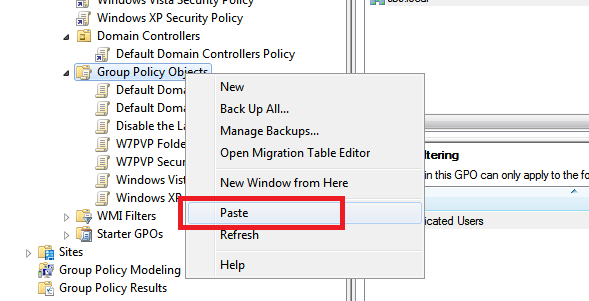 Right click Group Policy Objects, then click paste. 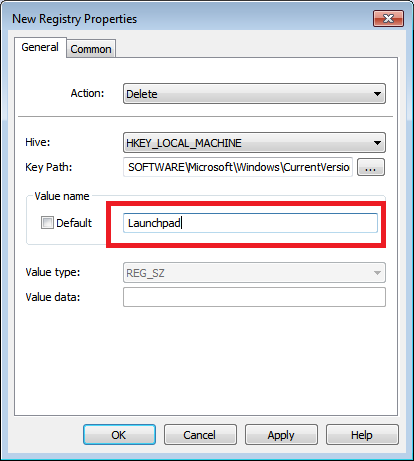 You will see a new policy, Copy of Disable Launchpad. Rename that. I renamed mine to Enable the Launchpad. 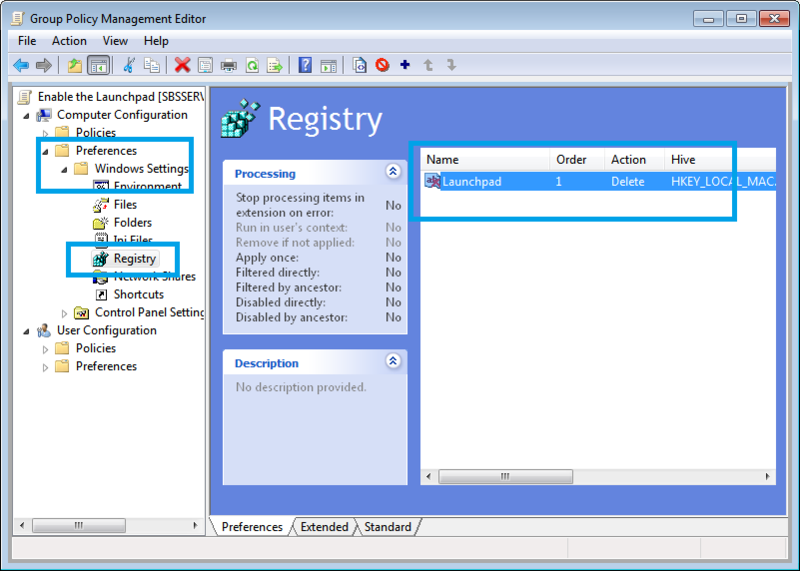 We need to edit the preserved Registry settings. Click OK to save the policy and close the GPO editor. When you want to re-enable the Launchpad, simply unlink the Disable the Launchpad policy from the domain, and link the Enable the Launchpad policy instead. Hey Robert, I do not know if you remember me but I was the guy over at connected digital world that wrote up the article for the automated SBS 2011 install about a year and a half ago. Anyways I’m currently deploying a Closed Windows Server 2008 R2 std AD Domain with 2 Windows 7 Pro Workstations and 2 Linux Workstations. I’m currently using Windows Storage Server 2008 R2 for backing up my Windows 7 Pro & Windows Server 2008 R2 clients. The Windows Storage Server 2008 R2 is currently running in a Virtual Machine attached to the Windows Server 2008 R2 Std Server that is running on a separate drive from the other drives on that server so the data and the backups are separate. 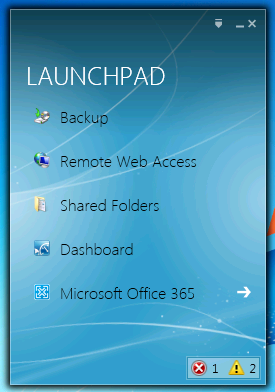 On the Windows 7 workstations I did not want my users seeing or playing with the Launchpad that pops up every time a user logs on. I tried the ms-config but could not find the start-up value to turn off so I turned to my buddy Google and your article for the SBS 2011 Launchpad came up. Since SBS 2011 and WSS2008R2 are literally almost brother and sister to each other I ran the GPO Disable the Launchpad per your very precise and graphically displayed article and it worked first time up on my setup. Launchpad no longer came up and WSS2008R2 was still connecting and backing up my clients. PS. and of course i remember you!